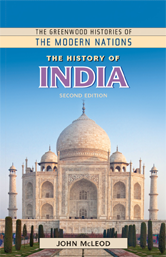 Written for high school students and general readers who have little background on the world's largest democracy, this second edition of a popular work provides an objective overview of Indian history with a particular focus on the modern nation. Readers can learn about the Bollywood craze, 21st-century economic growth, and concerns about the safety and equality of women today, as well as about such traditional topics as Buddhism and Hinduism, the Mughal Dynasty, and the British East India Company. Caste politics and the establishment of the Republic of India are covered, as is the life of Mahatma Gandhi.